We have been back only a week and it still seems like a dream to have seen the fruits of “our” labor… I say “our” because each of you who believe in us, in Charlie, and the work his Foundation does, made this dream come true. 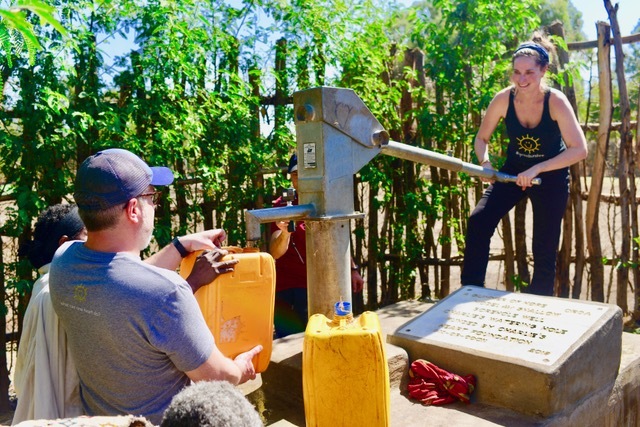 Last year, we hoped we would be able to fund the construction of a well, the first of many projects we wish to partner with A Glimmer of Hope on. We have waited and prayed for the day when Glimmer could tell us that yet in fact the well is complete, knowing there was a chance we might never actually get to see the well function with our own eyes. We knew with full disclosure, the ICD (integrated community development) where Charlie’s Watering Hole was needed, had been in a state of disarray from a political standpoint. 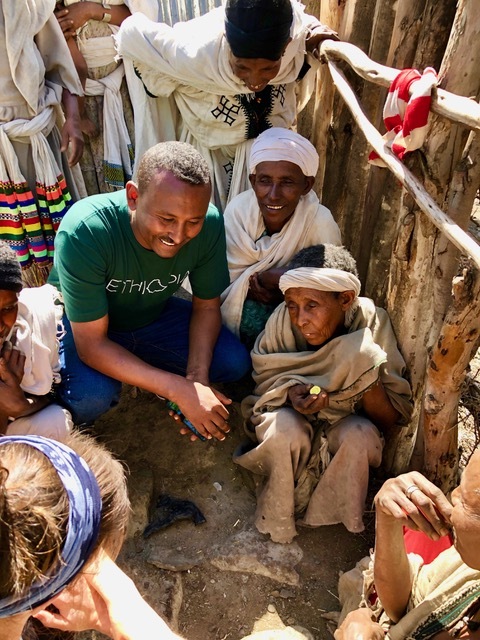 It was in fact not safe for us to visit Villages of Gondar in Amhara, Ethiopia because of rioting and civil unrest on last year’s trip. Ethiopia, like many African countries, has seen its fair share of crisis among its people. It has been one of the many factors in its inability to develop proper infrastructure and bring its people out of extreme poverty. 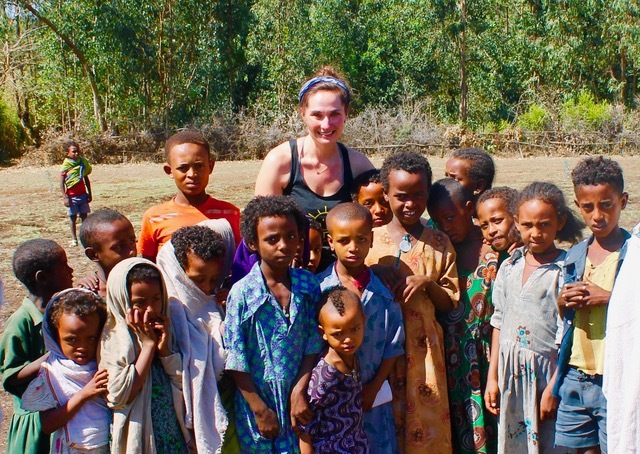 However, the need for clean water to remote areas in Ethiopia surpasses our first world desire to see that water flow. Charlie would know it flowed and that was enough for me and hopefully you all as well. I hesitated to even ask the Glimmer team whether or not we would get to see Charlie’s Watering Hole on this trip, mostly because I felt I already knew the response. However, when I finally got up the nerve to ask, it seemed like had I inquired earlier, it could have been fit into the itinerary but because I was so last minute, it might not be possible. 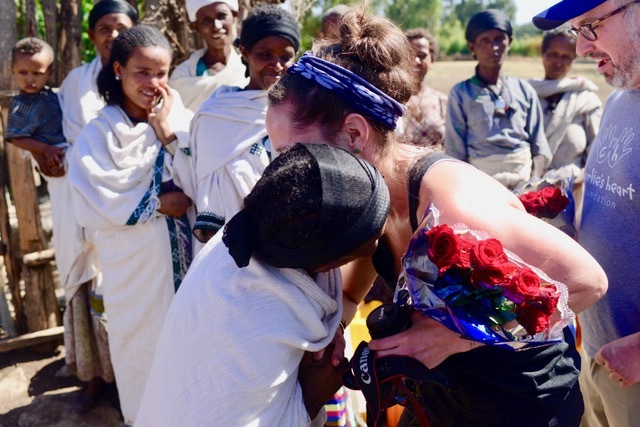 Nonetheless, our partnership with Glimmer (but truly friends at Glimmer) on the Ethiopian side, had already been working tirelessly to get us to the deeply rural area where Charlie’s well was constructed. Not only was the team making sure it was safe to get there, but also the remote location took us several hours from civilization with less than ideal roads (a term I use very loosely when referring to the dust covered, rocky paths) to traverse. Still, I didn’t allow myself to get excited about the notion of seeing the well until we were actually on our way there. Friends on our trip asked me how I was feeling about seeing the well, and I said I was indifferent. Because a character flaw of mine (at least Michael would refer to it as that) is I don’t get excited about things that are really important to me until they actually happen. It is self preservation that shields me from the disappointment that I could potentially face if plans fall through. It was a beautiful, treacherous drive we took on our journey to Charlie’s Watering Hole that day… very symbolic of our personal journey to get where we are today. The roads were bumpy, uncomfortable and long, just as our life has been since Charlie left this world. But amongst the discomfort, we passed thatched houses with toddlers playing… mothers, feeding their livestock and tending to small gardens and children walking to fetch water or on their way to the nearest school. Most all these families, stopped what they were doing as we drove by to smile, and wave at us… encouraging us to continue on to our destination. It gave me a sense of peace and gratitude, for all of the people who have waved and smiled at us along our journey with the death of our son, and the start of Charlie’s Heart Foundation. You have been our cheerleaders, supporting us and pushing us forward… making this project come to fruition. So thank you for that… each and everyone of you! I was asked to say a few words and regrettably, my on the spot speech was quite underwhelming given the levity of the situation. I was feeling so much in those moments at Charlie’s well that I couldn’t articulate the emotions into words. I was almost thankful that the people around me couldn’t speak English. And I hoped that the translators among us were fixing my most ineloquent speech in order to get the point across to our Ethiopian friends. 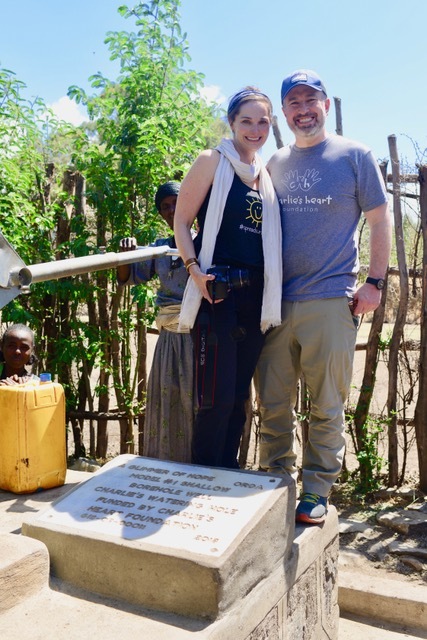 The plaque placed beside the well with Charlie’s name on it, reflected light off the metal pump, as Michael and I pumped a large jerry can full with water. I loved every minute of seeing Charlie’s love, like the water, flow in each drop. As we were beginning to say our goodbyes, I noticed this little elderly woman crouched down by the well, gazing up at me. She was absolutely gorgeous. I could imagine that each one of her wrinkles told a different story and I wished I could just sit next to her to listen to them all. When her eyes met mine, I immediately sat down beside her, kissed her cheek and hugged her close. Then I told her thank you, one of the few words I do know in Amharic. When I said it, her warm demeanor immediately shifted to a look of concern. Then she began to speak. Telling Charlie’s story to my new friend. Spreading lots of sunshine and thanking her for allowing us to be a part of their community. Now she will have a little piece of Charlie in her pocket. I was asked later by Donna, incredible founder of A Glimmer of Hope, how I didn’t cry during those moments of seeing Charlie’s well and being among the 250 people it served. She told me she couldn’t believe the intense smile I had on my face the entire time and wondered how that was possible given the journey we are on. I explained to her, there have and will continue to be so many times of sadness for me. But this is not one of them. This was such a happy day for me—a new memory, a tangible gift and an amazing experience I have because of Charlie. And I am so thankful and appreciative of that gift. A few of the children who are benefiting from clean water close to their school.